Hotel Ganga Azure is a chain of clean and comfortable budget hotels catering to your travel and lodging needs. 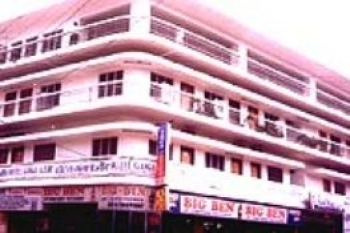 Hotel Ganga Azure is one of the most prestigious and unique budget hotels in Haridwar. Hotel Ganga Azure is an ideal place to stay for Corporate and Business travelers as well as tourists going to Hardwar. Hotel Ganga Azure is located in the center of holy town of Haridwar, just 5 km of bus stand, river ganga, city centre and many prominent locations. The are 42 luxurious rooms and budget rooms in Ganga Azure hotel. All the rooms are delicately designed to suit different tastes. These air-conditioned or air-cooled rooms are embellished with excellently carved rosewood furniture and superior quality fabric. Each room has wall-to-wall carpeting and is equipped with multichannel satellite television, intercom and attached bathroom with the facility of running hot/cold water. The Ganga Azure hotel offers tasteful food through our room service, restaurant and minibar. The minibar is stacked with snack items for meeting midnight hunger pangs of our guests. The room service and restaurant serve food for all tastes and palates. We offer cuisines like Indian, Continental, Chinese, Mughlai and other tastes. We also modify food preparation for our foreign customers on demand. By Air: The Jolly Grand Airport is around 35 km from Haridwar and Ganga Azure Hotel. By Train: Haridwar is well connected with all the important centres in India, either directly or via Delhi. By Road: Hardwar is connected with other towns/cities in north India by buses run by the UP Roadways and transport corporation of other states. Private bus operators are also there. Taxi service is also available. Approximate travel time for some important destinations are as : Rishikesh: 1/2 hr, Dehradun: 2 hrs, Delhi: 8 hrs, Shimla: 14 hrs, Nainital: 7 hrs, Almora: 10 hrs, Ranikhet: 9 hrs, Tehri: 5 hrs, Uttarkashi: 10 hrs.